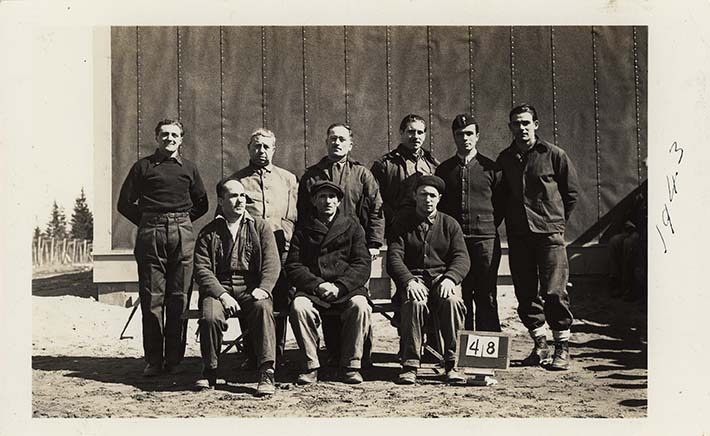 Double row of 9 internees; three are seated in the front. All seem to be wearing heavier clothes suggesting the picture was taken in early spring or in the fall. An identification card reading "48" is positioned on the ground beside the internee seated at the far right. The group is positioned in front of a building whose facing seems to be comprised of studded wood planks. Photograph is dated in black ink to 1943. As a result, this picture would have been taken in Fredericton Internment Camp, where the remaining Italian Canadian internees were transferred in July 1942. The identification card used suggests it was a formal picture taken by a government official. Further the back of the image is stamped "91C" in the lower right corner and "CANADA INT-OP CENSORED". Verso: Stamps: "91C" and "CANADA INT-OP CENSORED".